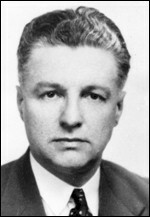 Skoropadskyj, Danylo [Данило Скоропадський] – prominent figure in community and political affairs, son of Hetman of Ukraine Pavlo Skoropadskyi; born on 13 February 1904 in Saint Petersburg, Russia; died on 23 February 1957 in London, England, United Kingdom; buried in Hampstead Cemetery, London. Danylo Skoropadsky attended the First Gymnasium secondary school in Saint Petersburg. For a while before the First World War he lived with his parents in Finland, where Pavlo Skoropadskyi was commander of the 20th Finnish Dragoon Regiment of the Imperial Russian Army. During the period when his father was Hetman of the Ukrainian State (29 April to 14 December 1918) he lived in Kyiv. There he attended a private gymnasium founded by Volodymyr Naumenko, a prominent teacher, community figure and editor of the journal Kievskaia starina. After the fall of the Ukrainian State in 1918 he left Ukraine for Switzerland, where he attended a French realgymnasium in Lausanne. In 1922 he moved to Germany (Wannsee, near Berlin), where his family had settled. In 1928 he graduated from the Berlin Institute of Technology in Charlottenburg. While studying in Berlin he was active in Ukrainian student life, was head of the Dnipro student organisation and a member of the Osnova society. From 1928 to 1932 he worked for the Siemens & Halske electrical engineering company. Skoropadskyj’s political views were strongly influenced by his close ties with Viacheslav Lypynskyi, Dmytro Doroshenko, Serhii Shemet, Oleksander Skoropys-Yoltukhovskyi and other neo-monarchist activists who had founded the émigré Ukrainian Union of Agrarians-Statists. At the end of 1932 he ceased working as an engineer and devoted himself fully to the Ukrainian cause. In 1933, on his father’s 60th birthday, he was officially proclaimed heir to the leadership of the émigré hetmanite movement. In 1934 he visited the United Kingdom for two weeks. In 1937-38 he made a tour of the USA and Canada, the countries which, at that time, had the largest hetmanite organisation (United Hetman Organisation – Soiuz Hetmantsiv Derzhavnykiv, or SHD) and the largest Ukrainian diaspora overall. During the visit he had numerous meetings with members and supporters of the SHD, and with Ukrainian communities of different phases of immigration and of diverse political and other leanings. On 27 January 1939 Skoropadskyj came to England on his father’s behalf and stayed for over a month. Together with Vladimir Korostovetz, Pavlo Skoropadskyi’s representative in Great Britain, he had various meetings in British circles. The likely purpose of the visit was to explore the possibility of transferring the centre of the hetmanite movement from Germany to the UK. On 21 July 1939, shortly before the outbreak of the Second World War, he came again to England where he lived until the end of his life. From 1946 he worked for 11 years for Dzus Fastener Europe, the UK arm of an aircraft component manufacturing company owned by William Dzus, an American of Ukrainian descent. Initially employed as an engineer, in 1947 he became technical director. After the death of his father in 1945 Skoropadskyj assumed the role of leader of the hetmanite movement. He was officially proclaimed as such on 5 November 1948 after his mother Oleksandra Skoropadska, whom he was visiting in Germany, resigned as regent of the movement. While in Germany he visited Ukrainian displaced persons camps near Munich, the Ukrainian Free University and the Ukrainian Free Academy of Sciences, and held meetings with prominent Ukrainian figures including Stepan Bandera. He attempted to achieve consolidation among various Ukrainian political groups for the sake of an independent sovereign Ukraine. Strongly critical of the establishment, by the UNR government in exile, of the Ukrainian National Council as the sole representative body of the émigré Ukrainian movement, he proposed an alternative structure for the body comprising equal representations of the four main political ideologies in the Ukrainian liberation movement of that time, personified by Andrii Livytskyi, Stepan Bandera, Andrii Melnyk and himself. Skoropadskyj was active in strengthening the hetmanite movement in the United Kingdom, in particular through the creation of the Ukrainian Hetmanite Organisation (Soiuz Hetmantsiv Derzhavnykiv) in Great Britain (officially established at an inaugural meeting in November 1949 in Bolton). He also became involved in the work of the Central Ukrainian Relief Bureau, which operated in London in 1945-48. In 1948 he was elected to the Governing Council of the Association of Ukrainians in Great Britain, and from 1949 until his death was the Association’s honorary president. In 1948 he was a member of the council of the Ukrainian Autocephalous Orthodox Church in Great Britain. From 1948 until his death he was head of the Relief Board for Ukrainian Students in Great Britain (KoDUS). He also cooperated with the Anti-Bolshevik Bloc of Nations. In 1956, together with other representatives of Ukrainian organisations in Great Britain, he submitted a memorandum to the British government condemning the totalitarian regime in the USSR and arguing for national self-determination of the Ukrainian people. He died suddenly at the age of 53 in unexplained circumstances.